Submitted by Roger Curry on 27th Jul 2018, 14:33. 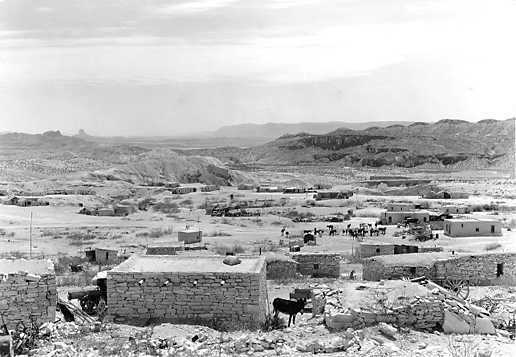 The Terlingua quicksilver district is a narrow, east-west area about 20 miles long, in the southern part of the Big Bend region of southwestern Texas. 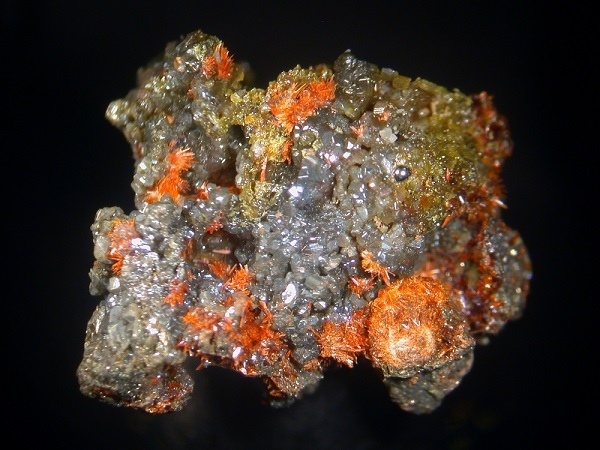 The cinnabar deposit was discovered by Comanche Native Americans, who used it for war-paint and petroglyphs. 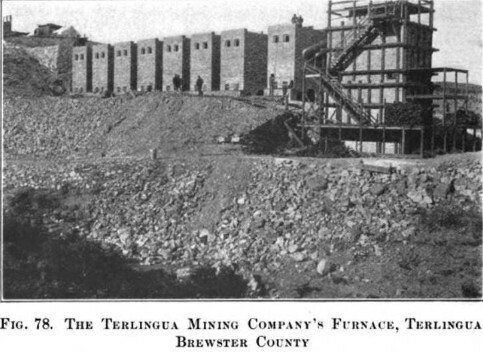 Commercial exploitation began in 1888, when Jack Dawson extracted the first Terlingua quicksilver. The area produced more than 150,000 flasks of mercury (5.2 million kg). "The cinnabar is roasted in the furnace on the right, and the mercurial vapour given off in the process is conveyed to the condensers on the left, eight in number, where it is cooled to the liquid form." With chemical formulas like that, this post could drive away non-chemists in their droves, even molybdenum gets a look in! Suffice to say, there’s been some extremely interesting chemistry going on at the Terlingua quicksilver lode. We’ll just look at a binary compound, another type-locality mineral from Terlingua, Montroydite. It has a friendly formula - HgO. Mercuric oxide. Scarlet Montroydite & Pale Yellow Egglestonite. Terlingua, Texas. Priestley discovered oxygen in 1774. A few years later Lavoisier disproved the phlogiston theory. They both used a chemical they prepared in their laboratories, “Red Calx of Mercury,” for their experiments. Mercuric Oxide. 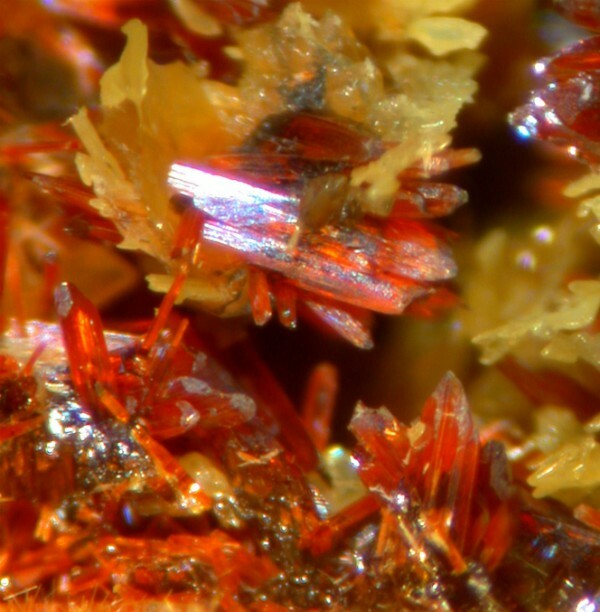 These great scientists would have been slightly interested, perhaps bemused, to find out that their red calx naturally crystallises into scarlet, transparent bendable crystals in Spanish Texas. 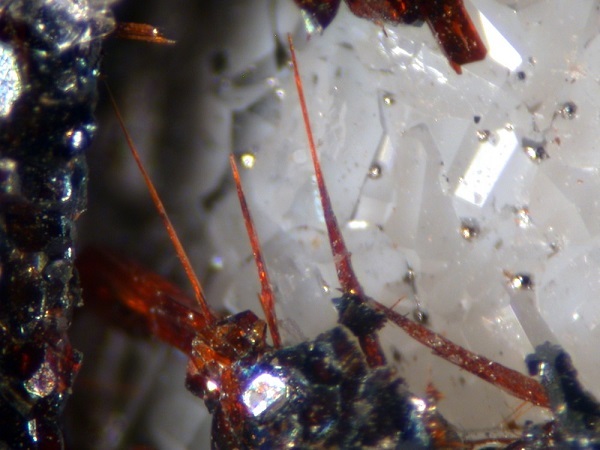 Named after Montroyd Sharp, owner of the Terlingua quicksilver deposit, Montroydites crystal structure at a molecular level shows that the weak bonding between layers could allow slippage along that plane. 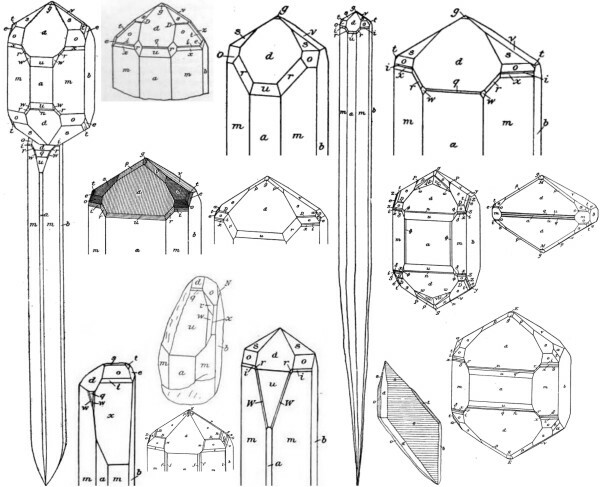 This is what is responsible for the remarkable ability of long crystals to be bent into permanent shapes. The crystal structure is apparently governed by relativistic effects. 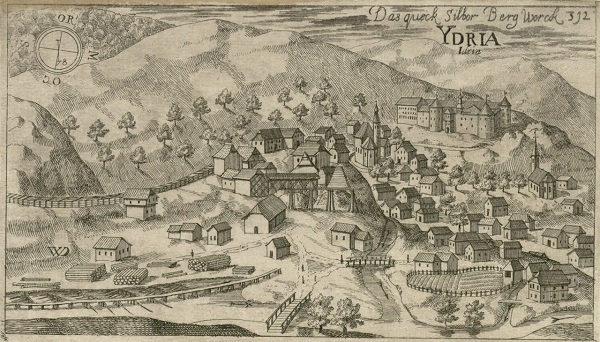 Idrija mercury mine, in 1679. It looks quite quaint, doesn’t it?.... When you’re dying of chronic mercury poisoning, toothless, emaciated, mind gone, salivating profusely, suffering convulsions and trembling of the limbs, trudging through the toxic atmosphere to the forehead for the next shift, - it was a living hell. The mine used forced labour, criminals sent down to work until, on average two years later, their inert bodies again saw the light of day. It was hot, 850 feet down in rock. Native mercury globules were everywhere. Rivulets and pools of quicksilver gathered in the passageways. The mercury slowly evaporates, turning the very air the miners breathed into a poisonous miasma. Even very dilute concentrations of mercury vapour, inhaled over many years, has dire consequences for the human body - especially the brain. Michael Faraday suffered from micromercurialism, just from the constant presence of mercury in his lab. The Idija mine’s Hg/air concentration was a couple of magnitudes above that of Faraday’s inhalation. So…. why were the mine-owners working criminals to death? A rope would have been more humane. Regular workers at Idrija commanded high wages and benefits, such was the known danger of trading health and lifespan for daily existence. The mine owners took in criminals because they were free, and didn't need to be taken to the surface until the end…. The medicinal use of mercury was widespread during the time of the Reformation. 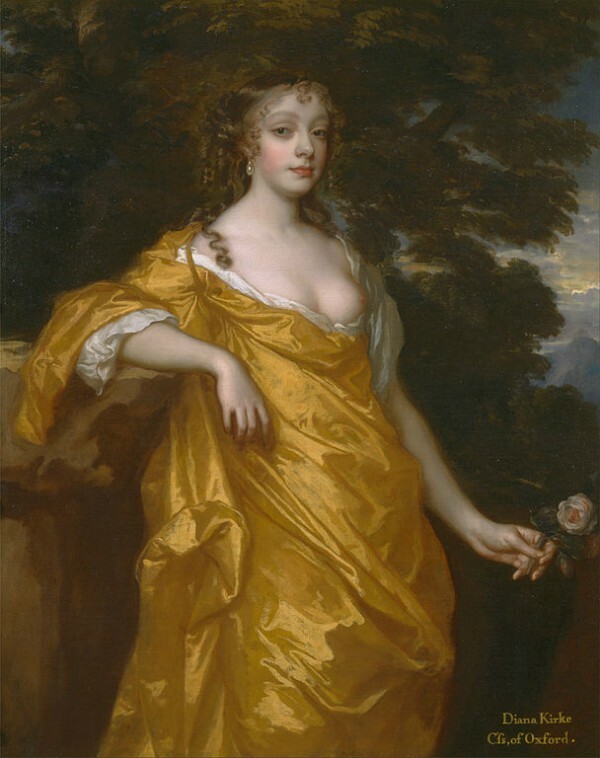 In demand for treating syphilis, typhoid and parasites, quicksilver also enjoyed widespread use by the “ladies of the court,” and women of means, for cosmetic purposes.